I shall rename this polish "Awesomesauce"
I went to Sally Beauty Supply to look for one thing and ended up finding about 5 other things instead. I'm so glad I did. This polish is one of my new favorites. Click to admire more closely! 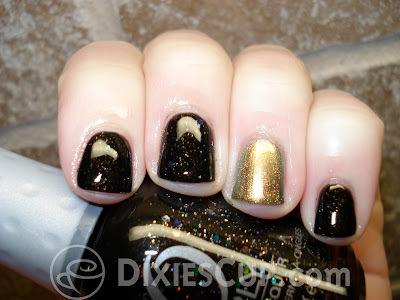 The black polish is Orly Androgynie. Although it is spelled differently, the term "androgyny" or "androgynous" basically means that something is partly male and partly female in appearance. In that case, I think the name of this polish applies quite well. 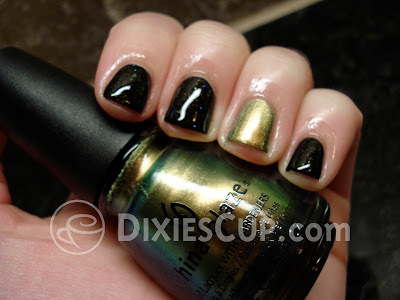 It is a black jelly base (the manly part) filled with multi-colored and iridescent glitters (the girly part). I only needed two coats to make it opaque, and I love how the glitters from the first coat show through the jelly of the second coat. It is kinda like a jelly sammich, except not. The formula was super easy to work with, too! As usual, I am wearing a base coat and a top coat in the photos.